The CD-130BK is Casio’s entry-level compact digital piano, offering unparalleled appeal to the aspiring pianist. The Scaled Hammer Action and Dual Element AHL Sound provide unrivalled technological advances that deliver exceptional authenticity and value. The unique Scaled Hammer Action delivers an accurate key weighting with an exceptional key response and feel. 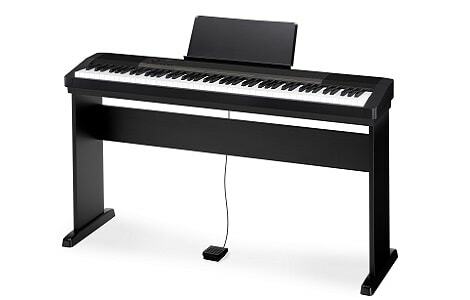 The crucial factor for any new pianist is always the building of finger strength and good technique and the CDP- 130BK, with its fully weighted key action facilitates this with distinction. A host of performance features including 10 high-quality tones, hammer response and key-off simulator assist the untried pianist in familiarising themselves with an authentic piano experience as they take their first steps in understanding the art of piano. The CDP-130 BK is available in a stylish Black Finish and includes both USB and Headphone connectivity.